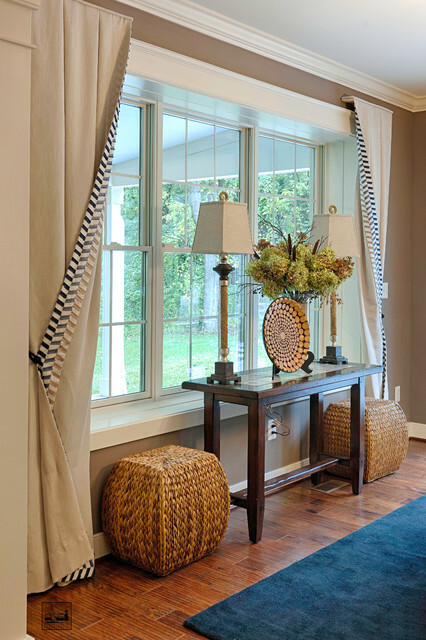 Here we have Custom Window Treatments in the Maryland Green Designer Show House designed by Gina Fitzsimmons ASID. The Linen Fabric makes a very tailored tent flap with the eyelash fabric as a trim down the inside edge. Curtains - I absolutely love this creative curtain design. Were they custom made? If so, who was the seamstress and where was the fabric purchased? Can you provide the specific fabric? Curtains - fabric? - From Smokey Mountains, TN Would you please identify the fabric and where it can be purchased? eyelash draperies (pulled back and held by button or something); designer in Md. i like the fabric framing the window but no heaving curtains.